I picked up two health books on a recent trip to the library. Have I ever told you how much I love the library? Whenever I hear about a new book by Tracy Anderson or someone else of interest, I will often go reserve it online. It may take weeeeks, but hey, it's free. And I'm ok with being a tad bit behind on the world's reading pace. 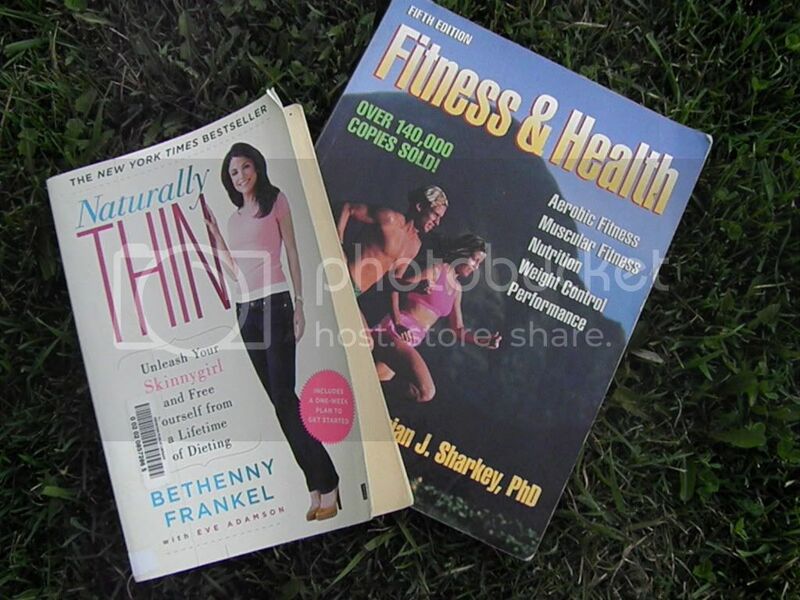 This trip, I grabbed Naturally Thin by Bethenny Frankel and Fitness & Health by Brian Sharkey. I have this fascination with becoming a certified personal trainer just so I know the science behind my workouts, not because I have a strong desire to start a new side business. When I found the Sharkey book, I knew that I had found what I was looking for. It looks like a textbook for an exercise physiology major. Yes, some of it is majorly boring, but I'm keying in on the stuff I really want to know about, like VO2 max and such. You're never too old to learn stuff! "The simple fact is that you don't function normally if you constantly have to measure, count, restrict, and obsess over food" (p.7). I love this! It really puts things into perspective, doesn't it? 'Nuff said. "No food is fattening, in a small quantity" (p. 45). Nothing is off-limits. Yipee. Just don't eat the whole cake in one sitting. I can do that! "Talking about and thinking about food constantly can result in eating more than you really need or want, just because food is on the brain" (p.61). So true! That's why it's so important to not make food such an obsession. Distract and reward yourself with non-food activities to start training your brain away from that connection. Food shouldn't be such a worrisome thing. "Make food special...Taking a little extra time to make your meal special will help you to feel so much more satisfied and content with your food" (p. 59). This relates to my previous post about making memories around healthy food. Food should be meaningful, not just something we shove in our mouths in between typing emails at work (oops, guilty!). Growing your own ingredients, refining your own recipes, and "designing" your own meals makes food more friendly. Let me narrow this all down: Make friends with food, but don't follow it around like a stalker. Ah, such sage advice from a former Desperate Housewife.